To get this working.. you will need to hack your bios to support the cards if they aren’t supported. 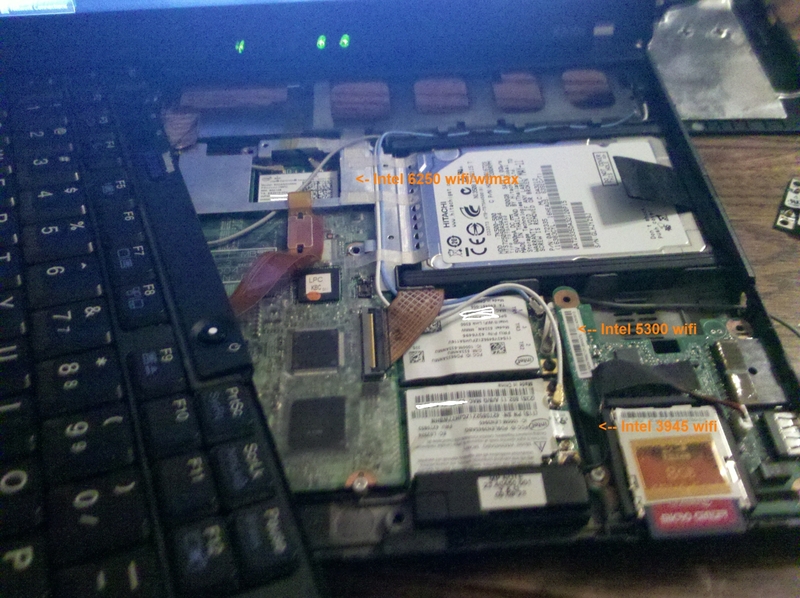 I used the Zender hacked bios. Next you need to tape down pin 17 on the bottom side of the PCI-e card. This allows you to use multiple cards at the same time. Normally, with this not covered windows will only let you use 1 card at a time. Now you need a card, that supports Promiscuous mode I used the intel 3945. I just added that to one of the slots. After booting disable your other cards in the hardware manager and install the driver for the new card. There is some weirdness with getting your other wifi card turned back on, to do this, I used intel my wifi, which turns the compatible card(intel 6250, intel 5300) on if they are off. I got some fans. I hadn’t done anything with the fans until now, but today I wired them up. The fans require 115V AC, so all I had to do was put a connector on the end and wire them all together. I had this old case lying around not being used, so I put the fans in the case. I give you The Vortex. I recently purchased a Logitech Wingman Extreme 3D pro. I always liked flight sims and space combat sims, so I thought it might be nice to play one again. I’ve played through a bit of Freespace 2. The game is still completely amazing, and it came out years ago. I was looking at newer games. The HAWX 2 game looked cool, but the DRM is crazy, and I would never buy something that required me to have an internet connection. I downloaded the demo to the HAWX game, the first one, because the DRM wasn’t as crazy on it. Sadly the game crashed my computer. Intel graphics cards are worthless for 3D gaming. Video playback – they are amazing, but they really need to fix the game handling. Today at work, I was asked to fix someone’s computer + router(Linksys wrt54g2) + wimax modem. Two other people tried, and weren’t able to get it working. I tried a bunch of stuff with the configuration files. I got the computer to work with the modem, and I got the router to work the modem (after updating the firmware), and my computer would work with it in the middle, but only on a wired connection. After playing around with it for a while longer I tested it with another router. It turns out that the router was bad. I will say this. After playing around with settings on that Linksys router, I never plan to buy one. Sure the product was faulty which is why it took me a while to fix the thing, but the interface was horrible and impossible to use compared to the D-Link routers that I normally use. I mentioned before that I ordered the nokia n900. I got it and tried it out. I was disappointed because while the device had a keyboard it was useless for anything other than text entry. It seems all anyone cares about these days are touchscreens. Thankfully Amazon let me return the phone. I did pay for the return shipping, but $5 was worth it to try out the device. So I’m back to using the n810. I’m happy with it for the most part. It would be nice if the keyboard were a little better. The other day my dad got issued the Casio GzOne phone. I must say, the keyboard on there is amazing. Sadly the software Verizon stuck on it is horrible and makes it worthless because you can’t do anything with the keyboard. The main problem with the n810’s keyboard is the top row. There isn’t enough room for you to press the buttons because the edge of the screen sits so close to the top of the keyboard. So.. I’ve been working on my second book DreamPhase 2-The Controllers for a couple months now. I started a week before school started and I had 20,000 words by the first week. Things slowed down after school started, and I’ve been getting a couple thousand words done a week. At the moment I’m up to 58,003 words. One of the problems I ran into is that I have multiple computers and I’m not always at the one that has the latest copy of my book on it, so I have to copy files around if I want to work on it. This is kinda a hassle. I looked into some syncing software. I came to Dropbox eventually. Dropbox has a paid and free version. With the free version you get 2gb of storage, but the cool part is that you can sync your files across multiple computers. I downloaded it and took it for a spin. I am extremely happy with their service, and 2GB is plenty of space to store my writing. So if you have to edit documents or files on multiple computers and need some way to sync them, their service might work great for you. I don’t think that it will be, but I really dislike spending large chunks of money. You will probably hear more about it.